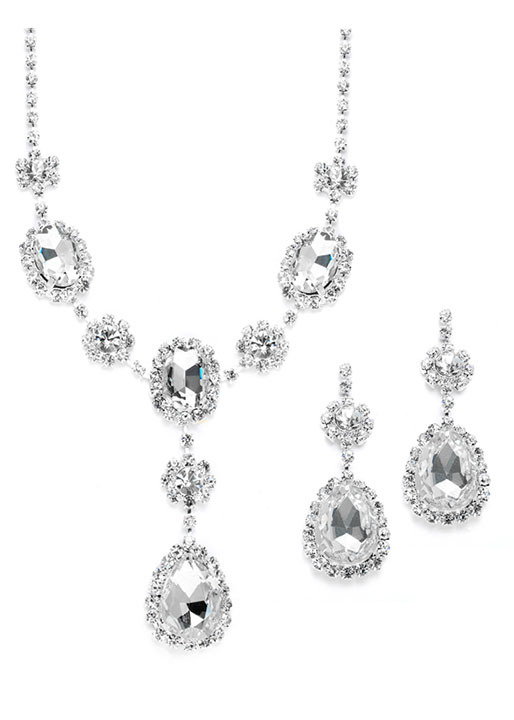 * Mariell's sparkling necklace & earrings set has Genuine Crystal Clear Rhinestones with bold Teardrops. * The adj 16"- 22" neck has a 2 1/2" h center drop & the dangle earrings are 2" h.
* Our rhinestone set is great for bridesmaids or proms at a super low wholesale price! * It has an adjustable length necklace to accomodate plunging necklines or plus size customers. * This is an essential for your store's jewelry collection!